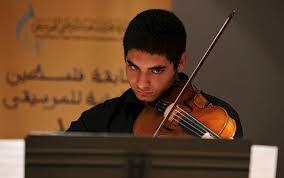 At age 18, Omar Saad, a young Druze Palestinian musician from the Galilee village of al-Mughar received the usual summons to enlist in the Israeli army. Recent studies show that if given the choice, two thirds of Druze youth would not enlist. But they do not have a choice. Since 1956, enlistment in the Israeli military has been compulsory for Druze citizens of Israel. The Druze are a monotheistic religious community which emerged during the 11th century. They live primarily in Syria, Lebanon, Palestine (now Israel), and Jordan. Soon after the 1948 war, the newly created state of Israel instituted a divide and conquer policy to separate the Druze from other Palestinian Israelis. This included providing the Druze with greater financial and political support than other Palestinians, registering them as a separate ethno-religious group (“Druze”, not “Arab”) in official ID documents, and creating a separate education system for them. As intended, this policy led to increasing Israelization of the Druze, and to reinforcing the idea that in the Middle East conflict, the Druze and the Jews share common interests as opposed to Palestinians and Arabs. As a result, in 1956 the Druze leadership accepted conscription (it is not applied to other Palestinians). However, from the beginning there has also been active resistance to forced conscription. I refuse to appear for tests, because I oppose the law of conscription imposed on my Druze community. I refuse because I am a man of peace and I hate all forms of violence, and the military institution represents for me the peak of physical and psychological violence. Since I received the notice to appear for tests, my life has changed. I became more nervous, my thoughts were distracted, I remembered thousands of cruel images, and I couldn’t imagine myself wearing military uniform and participating in the suppression of my Palestinian people or fighting my Arab brothers. I oppose the recruitment to the Israeli military and any other military for conscience and nationalistic reasons. I hate the injustice and oppose the occupation; I hate intolerance and restriction of freedoms. I hate those who detain children, the elderly and women. I am a musician, I play the Viola. I have played in many places, I have musician friends from Ramallah, Jericho, Jerusalem, Hebron, Nablus, Jenin, Shfa’amr, Eilabun, Rome, Athens, Amman, Beirut, Damascus, Oslo. We all play for freedom, humanity and peace; our weapon is the music and we shall not have any other weapon. I am from a community that is unjustly treated by an unjust law. How can we fight our relatives in Palestine, Syria, Jordan and Lebanon? How can I hold arms against my brothers and people in Palestine? How can I be a soldier standing at Qalandia checkpoint or any other checkpoint, after I experienced the injustices at these checkpoints? How can I prevent someone from Ramallah to visit his city, Jerusalem? How can I guard the apartheid wall? How can I be a jailer to my own people while I know that the majority of prisoners are freedom prisoners and seekers of rights and freedom? I play for joy, for freedom, for a just peace based on halting settlements, the end of the occupation in Palestine, the establishment of an independent Palestinian state with Jerusalem its capital, the release of all prisoners in prisons and the return of displaced refugees to their homes. Many of the youth from my community have done the compulsory service in the army, what have we received? Discrimination in all areas, our villages are the poorest, our lands were confiscated, there are no master plans, and no industrial zones. Percentages of university graduates in our villages of the lowest in the region, the unemployment rates in our villages are the highest. This mandatory law has kept us away from our Arab connection. I, Omar Zahr Eldin Mohammad Saad, will not be the fuel to the fire of your war, and will not be a soldier in your army. What a brave young man and how moving his letter. Is there an anti-conscription movement in Israel? do Druze people join it? and if so is it something that Omar can connect to? I wonder too if there is a musical grouping – like the joint jewish arab orchestra – which might take up his cause and, by implication, the cause of others like Omar. Michael, thank you for keeping us posted. An Anti-conscription movement? Yes, New Profile. Really it’s an anti-militarism movement, and among other things it supports Israelis who refuse military service. See chapter 11, Civil-izing Israel, in Our Way to Fight. More information on The Druze Initiative Committee for Conscientious Objection here.